It really has been a year since we started working on the Bridge Street Community Garden, and it has become more than we could have imagined. So why not celebrate? The garden is producing lots of lovely fruit, veg and flowers, has lots of regular visitors and volunteers, and has recently won £10,000 in funding to make it even better. So we are having a birthday bash in the garden to thank all the volunteers and plan for the year ahead. Everyone is welcome, new and old. 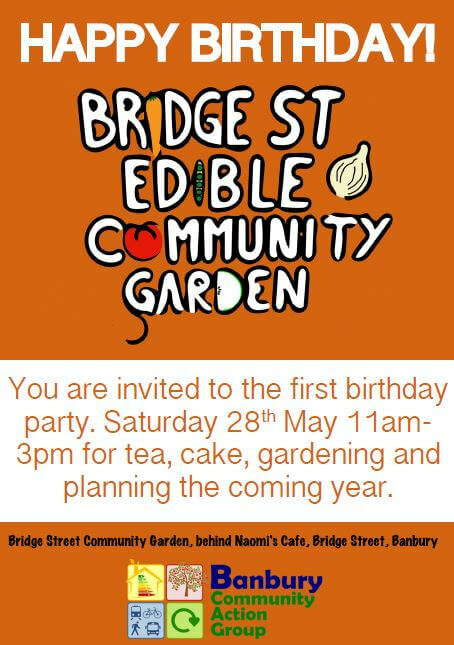 There will be tea, cake and gardening, what more could you want.